• The compact keyboard is about 36% smaller than our standard keyboards but still has all the standard keys—so doing the things you love is as easy as ever. • So you can work or play in more places—like your comfy couch—the wireless connection virtually eliminates delays, dropouts and interference and gives you range of up to 10 meters (33 feet). • The tiny receiver stays in your laptop. Plus, you can easily add a compatible wireless mouse, keyboard or number pad—without the hassle of multiple USB receivers. 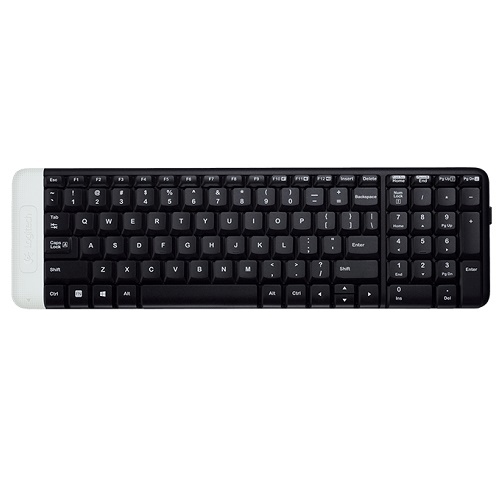 • It helps protect your information by encrypting data transfer between the keyboard and receiver with one of the highest levels of data encryption available. • With the extended battery life and auto-sleep, you can write Facebook updates, emails and Yelp reviews for years without the hassle of changing batteries. • The battery door on top of the keyboard doubles as a fun design element with light gray, pink and blue options you can swap in to suit your mood or décor. • Setup couldn’t be easier—you simply plug the wireless receiver into a USB port on your computer and start tweeting , blogging and IMing right away without software. • The keys barely make a sound, so you can hear the song you’re listening to and not what you’re typing.